Iran announced Monday that it is banning imports of over 1,300 products to prepare its economy for the reimposition of sanctions on its nation and the drop of its currency to record lows. According to Reuters, Mohammad Shariatmadari, Iran’s Industries and trade minister, slapped the import ban on 1,339 goods from abroad, including home appliances, textile products, footwear, leather products, furniture, and healthcare products. The government argued that these goods could, instead, be produced in Iran. Iran’s rial sank to a record low of 90,000 rials against the U.S. dollar on Monday. At the tail end of 2017, it reportedly stood at 42,890. The currency deficiency appears to be the result of Iran’s adventurism abroad, specifically its decision to spend billions of dollars in places like war-torn Syria to support President Bashar al-Assad. The Foundation for Defense of Democracies (FDD) noted that Iran spends $15-20 billion per year supporting Assad. In addition to this, Iran has opted to spend billions of dollars in financial aid to Palestinian terror groups Hamas and Islamic Jihad, Lebanon’s Hezbollah, Yemen’s Houthi rebels and its Shiite militias in Iraq. Over 40 percent of Iran’s population is unemployed. According to the Chicago Tribune, Iran’s state-run and semi-official ISNA news agency reported that Parliamentary (Majles) speaker Ali Larijani, said on Tuesday that Rouhani’s administration has fallen short of confronting Iran’s deepening economic problem. 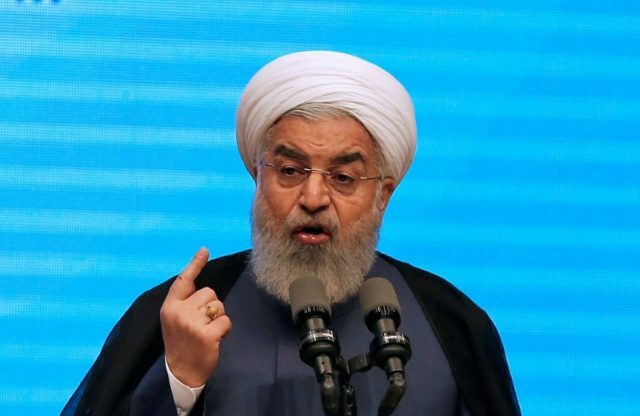 According to the Reuters news agency, Rouhani also said, “Even in the worst case, I promise that the basic needs of Iranians will be provided. We have enough sugar, wheat, and cooking oil. We have enough foreign currency to inject into the market,” he claimed.